For as long as I can remember, I have always wanted to visit Australia. Maybe it was from watching the famous Australian soap opera Neighbours as a teen and sympathising with all the teenage angst, or maybe it was the idea of a far away land. I was intrigued by the island, the natives and the vastness of the country and add to that The Sydney Opera House, The Great Barrier Reef and all the amazing coastal cities Australia has to offer, it is still very much on the top of my list. I am quite positive that these are the real reasons why I wanted to always visit Australia and not because I had a huge crush on an Australian stud. That crush went no where (though it’s a highly entertaining story if anybody wants to hear it) but thoughts of Australia have always lingered. After I started this blog, I added even more reasons to want to visit Austraila; my amazing blogger friends. Most of the time, reading their blogs I am turned upside down and inside out; when it’s day here, it’s night there, we have summer when they are having winter. I have yet to get used to it! The friends I have made are an exceptional set of women. There is Jasmine from the blog, Absolutely Jas. I strongly believe that if we lived in the same city, we’d be best friends and hang out at various tea and coffee places. I find more and more, from reading her posts, how much we have in common; recently I discovered our mutual dislike of ricotta cheese (because of its graininess). Then there is superwoman Charlie, from Hotly Spiced, we also have a lot in common, she has three children and I have four. We both have to deal with a high maintenance vegetarian and an energetic eight year old with many, many questions. Uru, from Go Bake Yourself is vibrant and vivacious, and though we are not any where close in age, she is the same age as my daughter and I can relate to a lot of what she goes through, not to mention she makes some fabulous treats and her posts are thoroughly entertaining. Sonali from Sugar et al, is one of my newest and sweetest friends. We both have an Indian background and so, many things in common. Her brother lives in Denver so I hoping that she will visit him soon so we can meet! She has a beautiful blog with beautiful photos and show stopping, professional bakery type desserts. So, by now you would’ve realised that a Pavlova is an Australian and New Zealand invention and staple. It was named after the Russian ballerina, Anna Pavlova when she visited the countries back in the 1920’s. It is considered mainly a summer time dessert often being served with fresh berries and cream. I have to admit that making this Pavlova was really a matter of necessity. After I made the tiramisu for my daughter’s 16th birthday, I had 5 egg whites left after making the zabaglione. I hate wasting egg whites, and I was racking my brains as to what to do with them. My mothers old cook books from England always included recipes for Pavlova. I remember as a child looking at the photos and being fascinated with this crispy, crackly shell filled with fruit. When I started cooking and baking, this was always on my to do list. Today, I can tick that off! To make it autumn themed, I decided to use pears as my fruit. Unfortunately, poached pears look a bit pale and colourless on top of an already quite white meringue shell. I wanted to add some red colour and flavour without using wine (since we don’t drink). Raspberries are perfect for adding red colour and make a pretty good sauce too. The meringue shell recipe is from Donna Hay and I just added my recipe for the poached pears on top with a raspberry sauce on the side. A crisp meringue shell filled with whipped cream and topped with pears poached in raspberry syrup. 2 cups/470mL heavy cream, whipped until soft peaks form. Line a baking tray with parchment paper and draw a 8"/20cm circle on the underside. Whip the egg whites until they form stiff peaks. Add the sugar and beat until glossy and thick. Add the cornstarch and the vinegar and blend until just incorporated. Dollop the egg whites onto the parchment paper using the drawn circle as a guide. Make an indent in the middle to hold the filling. Place in the centre of the oven and bake for 1 hour and 15 minutes. Turn off the oven and allow the shell to cool completely in the oven. While the shell is baking, make the poached pears. Place the pears in a single layer in a large pan. Add the frozen raspberries, ginger, water and sugar. Mash the raspberries with the back of a spoon. Allow to simmer uncovered until the pears are tender and the water has reduced to a syrupy consistency, about 30-40 minutes. You may need to add more water if the pears have not softened. Make sure the raspberries don't stick to the bottom of the pan. Stir occasionally and turn the pears to get even colour. Once the pears are tender, remove them from the syrup. Strain the liquid to remove the seeds, ginger and pulp from the berries. Add the syrup back into the pan and reduce more if desired and then add the pears back into the sauce to keep from drying out. Once the shell is cool, and right before serving, fill the shell with the whipped cream. Remove the pears from the syrup draining the syrup, and arrange on top carefully. The shell will probably give and crack in areas but it should hold. Serve immediately with extra syrup on the side. The best pears to use are the Bosc. I had to use Bartlett because I could not find any organic Bosc. To stop the Bartletts from falling apart, I took them out before they were completely tender. The Pavlova was still delicious but the pears were harder to cut. You can add more sugar if you want your syrup sweeter and you may need to top of with water if the simmering liquid evaporates before the pears are tender. The Raspberry Poached Pear Pavlova was a hit at home. The children and the husband all thoroughly enjoyed it. The textures; creaminess of the whipped cream and soft marshmallowy insides, and the crisp meringue shell along with the sweet tart flavours of the raspberry sauce, all blended beautifully together. So, if you haven’t tried a Pavlova before or have been intimidated by it, don’t be, it’s fairly easy and incredibly delicious. It’s also an impressive dessert for a holiday table or a special occasion. Hope your week is going well. I am at my usual frantic pace, dropping and picking up children and in between that finding time to cook, create, shop and write. I suppose it keeps me young….maybe. What a beautiful dessert and it is on my to-do list well…has been for a long time! 🙂 The Aussie blogger friends are just the best aren’t they! You are too cute jumping slap bang into the middle of the old pavlova contest between Aussies & Kiwis. It was definitely the Aussies who came up with it first. Gorgeous photos and I think your raspberry poached pears are inspired! Dear lord, this looks so good it should be illegal… another winner Nazneen – you’re really on fire at the moment! What was that thing you made the other day? I’ll have to go back and look (drool) again. I only ever had a strawberry or raspberry pavlova before, and this actually reminds me that I haven’t actually had a pavlova at all in… well, years. Not since my teens I don’t think. The poached pears look rich and luscious on top – definitely a combination I’m going to have to remember – thanks so much for sharing! Isn’t it great all the wonderful people you meet through blogging. I know my non blogging friends look at me a little sadly when I mention any of you but I’m the one feeling sorry for them that they don’t get to share wonderful experiences and fabulous food. Love your Pavlova, wonderful colour fruit and I bet it tastes georgous! i absolutely love what you did with pavlova here. Oh Nazneen! How gorgeous are these pears atop that pillowy white cloud of goodness! I just love pavlovas. So simple and elegant at the same time! Thanks for introducing us to your Australian friends! The only one I know is cute little Uru…but I will be sure to check out everyone’s sites! This dessert is absolutely stunning! Oh this looks scrumptious. just waiting to be eaten. Never tried my hands at pavlova. But the pics are tempting me try soon. Divine pavlova — love the flavors!! That color is amazing. What an elegant and sophisticated dessert! I, too, have never been to Australia, and would love to go – in part just to meet all of the amazing bloggers from there and New Zealand! I make meringues all the time, but rarely a pavlova. Gotta do it someday. Great tribute! OMG! This is so pretty…I never made pavlova and it is on my list of “to do” for ages…now seeing yours with poached pears…I must try it! Thanks for the recipe…it is sure a true inspiration for me. Thats one of my favorite parts about blogging, you meet people from all over the world that life would never connect you with otherwise. The pavlova is absolutely gorgeous, the fruit on top looks complete luscious! I’ve never had one before. How about you come to London and make me one :)? Nazneen, you truly have managed one of the prettiest pavlovas I have seen . . . and, since I too am Australian, I have seen a few 🙂 ! I love the shape you have managed ~ it SO looks like the real thing and I shall make note of the topping and try to make it myself. Am not a sweets/baking gal but the pav is iconic and just has to be on the menu!! And come Down Under soon: there is much more here than the Opera House and the Barrier Reef!!! Gorgeous dessert! love the color of raspberry poached pears. Wow, Nazneen! This is the most beautiful pavlova that I have ever seen…I am so sharing it!!! Denise Browning@From Brazil To You recently posted..Brazilian Cheese Rolls with Kalamata, Basil, and Feta…Get Yours! The colour of those poached pears is awesome! 🙂 Looks delicious. What a great idea! I only learned about pavlova after I saw a few recipes on food blogs. I haven’t had this dessert in my life (not a very common dessert option, maybe that’s why?). It looks so pretty and I love your poached raspberry on top! I agree how lucky we are to meet wonderful people through blogging, that’s the best thing. Probably one of the things I never thought of before blogging but now I believe that it’s one of the most valued part of blogging. So nice to be introduced to so many blogs. thanks. Hope you get to Australia soon and I enjoy Pavlova and your looks really good. Thanks Francesca, it was really delicious and you are very welcome!! Thank you, thank you! These bloggers are wonderful ladies and I am honoured to call them friends. You’re too funny Nazneen, Neighbours? Really?!! Hahaha. I have to admit, I’m well travelled. I get the travel bug and get itchy feet to leave but then every time we land back in Sydney I wonder why we left in the first place. I’m so lucky to live in this gorgeous part of the world. Your Pav looks really really REALLY good! I know Lisa. I loved Neighbours, what with Jason Donovan AND Guy Pearce? There were many reasons to love it!I too have been very fortunate to travel but all at a young age. Lately, its just about children and home. My feet have been itching for years. Oh well, once all the kids are out of the house I guess!! Oh lovely, you are just too kind 🙂 I am absolutely with you too, while you are definitely the most special, the blogging community is just awesome – I never realised how much I would love ‘meeting’ new people and just how genuinely nice everyone would be. 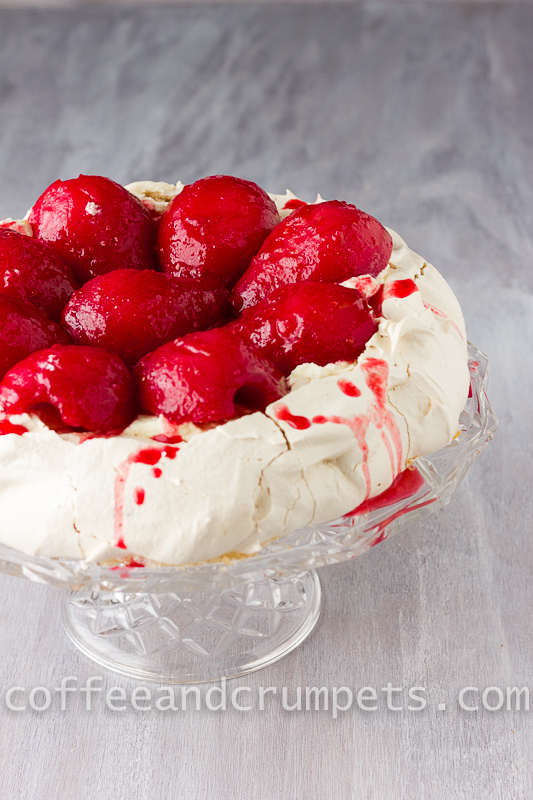 Your pav looks delicious – It’s one of my favourite desserts, I adore the texture! And I’ll forgive you for giving those pesky New Zealanders part credit for coming up with something so fabulous, it’s a hotly contested matter (almost as fiercely contested as ‘who invented the lamington’!!). You make sure you keep me posted if you make those plans to come to Oz 🙂 Likewise, I’ll let you know if we come over to the States and Colorado – one of our best friends has just moved to Boulder to study! I had no idea that these lovely ladies were all in Australia! This Raspberry Poached Pear Pavlova looks so amazing! I am not even a big fan of meringue, but your gorgeous pictures make it beyond delectable! I have always been intimidated to try making pavlova. Thanks for the inspiration, Nazneen. Thanks Lail. Hope you try it! You are such a doll Nazneen! Thank you for the lovely words..blog hugs! I can say with absolute certainity that the best thing that has happened to me since blogging are meeting wonderful people like yourself. I can’t wait to make a trip to Denver..my brother is actually jealous ever since I told him. I would be happy to extend the same invitation to you. How about a trip down under! The pavlova is one of the best I have ever seen. It is so unique…unlike the ones we see around. Looks like a treat fit for a king. And raspberries…need I say more!